In a US diplomatic cable made public by Wikileaks, a Pfizer official wrongfully claims MSF was involved in the company's unethical drug trial in Nigeria in 1996, a falsehood Pfizer should correct. 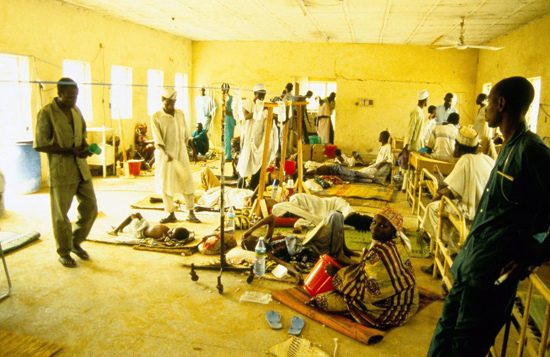 Patients receiving treatment from MSF in the dire confines of the Kano State Hospital in 1996; Pfizer conducted its trial elsewhere in the building. Pfizer has issued the following statement to Nature Medicine: ?The allegations contained in news reports surrounding this US Embassy cable are false, including the notion that MSF administered Trovan during the 1996 meningitis outbreak. To our knowledge, that did not happen. We regret any confusion that these news reports may have generated." Among the US government diplomatic cables recently published by the Wikileaks website were details of a meeting between an official from the pharmaceutical company, Pfizer, and US Embassy officials in Nigeria in April 2009. At the time of the meeting, Pfizer was in the midst of a legal battle with Nigerian government officials regarding a medically unethical antibiotic clinical trial in children. The clinical trial took place in Kano State in 1996 during a massive meningitis outbreak. Pfizer carried out the trial of the oral antibiotic trovafloxacin, branded Trovan, even though there had not been any previous medical evidence that it could be effective against meningitis. The Pfizer researchers conducted the trial in Kano State Hospital, where a Doctors Without Borders/Médecins Sans Frontières (MSF) team was treating children using a preferred and clinically approved antibiotic regimen for bacterial meningitis. A US$75 million settlement with the State of Kano was reached July 30, 2009. Other cases are still pending before the US courts and the Nigerian federal government continues to pursue legal claims against Pfizer. It is against this backdrop that Pfizer falsely accused MSF in the US diplomatic cables of using Trovan. Documented evidence has shown that these accusations are patently false. MSF did not, at any time, administer Trovan to patients. Litigation connected to this case and comprehensive investigative reports on the matter suggest that Pfizer's attempts to rewrite history are intended to deflect responsibility for the company's actions. MSF was not working in the same part of the hospital in Kano State as Pfizer clinical researchers, and MSF staff had no connection to Pfizer. When MSF staff became aware of what Pfizer was doing, they were appalled at the practices of the company?s team. MSF personnel on the ground communicated their concerns to both Pfizer and the local authorities. "It was not a time for a drug trial," says Jean Hervé Bradol, former president of MSF France, to whom the Kano teams were reporting at the time. "They were panicking in the hospital, overrun by critically ill patients. The team were shocked that Pfizer continued the so-called scientific work in the middle of hell." Pfizer officials have made no attempt to clear the record as of yet and retract these unsubstantiated claims against MSF. A handful of internet reports have adopted the version of events proffered by the Pfizer official. ?Behind a gate besieged by suffering crowds stood two very different clinics. A humanitarian charity, Doctors Without Borders, had erected a treatment center solely in an effort to save lives. Researchers for Pfizer Inc., a huge American drug company, had set up a second center. They were using Nigeria's meningitis epidemic to conduct experiments on children with what Pfizer believed was a promising new antibiotic?a drug not yet approved in the United States.? The article later triggered the various legal proceeding taken by the victims and Nigerian authorities against Pfizer. With proven treatments at hand, Pfizer instead chose to carry out tests for an unproven drug on children whose lives hung in the balance. ?The situation?called for using treatment protocols known to be effective rather than carrying out clinical trials on a new antibiotic, with uncertain results,? said Dr. Bradol.